event selling my art work. Received from Eileen on January 5, 2012. At my recent sale, due to great support from family, volunteers and the public I raised $420 (12 bedkits) for SCAW. 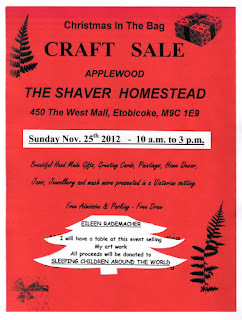 As posted on the Simcoe.com website, November 19, 2012. 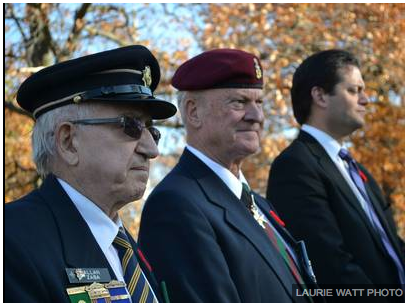 BARRIE - Friends of the late Al Zaba have two opportunities to pay their respects. Zaba – owner of the old A&M Superfood store – died Wednesday, Nov. 14 at the age of 83. A celebration of life is planned Nov. 22 at the Army, Navy and Air Force Club at 7 George St. from 1 p.m. until 7 p.m.
A memorial service is also planned at St. George’s Anglican Church, 9 Granville St., on Nov. 28 at 2 p.m.
Memorial donations can be made to Sleeping Children Around the World, Salvation Army of Barrie Bayside Mission Centre, Royal Victoria Hospital Foundation, John Howard Society of Thunder Bay and District, or your charity of choice. 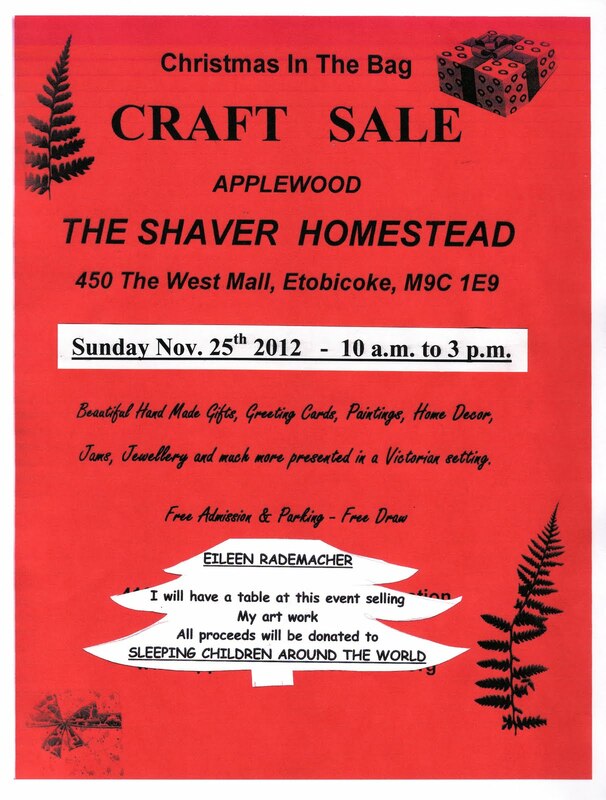 As posted on the West Carlton EMC website, November 15, 2012. EMC news - What started out as a couple of packages of seeds have grown into 40 bedkits for "Sleeping Children Around The World". In late May, the Youth Group of St. Paul's United Church in Carp decided to raise money to buy bedkits for children half way around the world following a presentation by one of the members of St. Paul's. Quickly offers of vacant land, rototilling and fertilizing the land were made and on June 4, a group of 8 eager youths and two adults volunteers all with shovels in hand, planted the seeds. Over the summer the plants grew, helped by occasional watering and weeding. By October the pumpkins of all sizes were ready to be harvested. On two Saturdays in October the pumpkins were offered for sale from the steps of the church located at 3760 Carp Rd. near the Carp Fairgrounds. 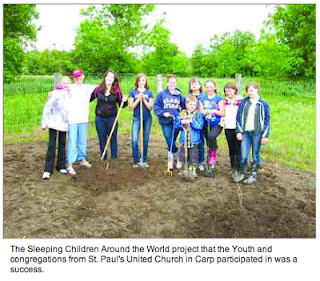 The Youth Group had a goal to raise enough money to buy five bedkits, but the idea caught on and with additional support from the congregations of both the Carp and Dunrobin churches, enough money to buy 40 bedkits were raised, with the youth raising almost half of the money. 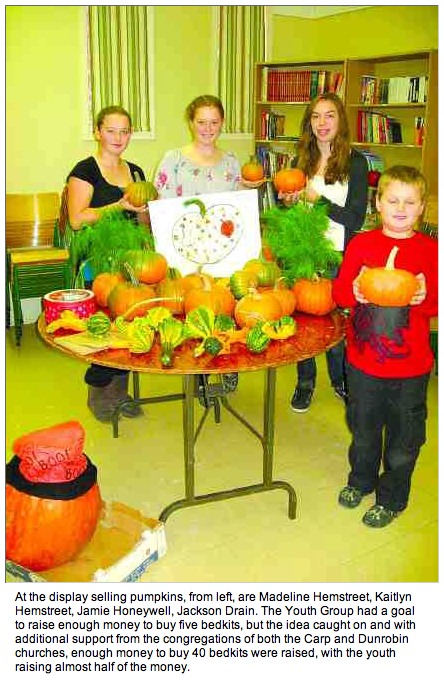 "The youth were so excited to see the pumpkins growing and then the response from the greater community was wonderful," said Sue Hemstreet, coordinator of this project. "We far exceeded our goal!" Sleeping Children Around the World (SCAW) is a true not for profit organization, founded in 1970 by Murray and Margaret Dryden (parents of NHL goalie Ken Dryden) whose belief is that "it is the right of every child to have a peaceful night's sleep". All monies raised are used to buy bedkits which are distributed overseas to needy children of any race and/or religion in developing and underdeveloped countries. Over one million bedkits have already been distributed. Each bedkit typically contains bed mattress, blanket, pillow, mosquito netting, clothing, shoes, school supplies (pencils, pens, eraser, notebooks), all in a bedkit carrying bag/school bag. Each bedkit is tailored to the local needs of the area of distribution. For more information check out www.scaw.org. "Participating in this program has blessed us with a greater understanding of the importance that children around the world/sleep well in warm, dry beds," said Rev. Karen Boivin, minister of St. Paul's and Dunrobin United Churches. "It means better health and a greater ability to learn at school which in turn helps their communities." 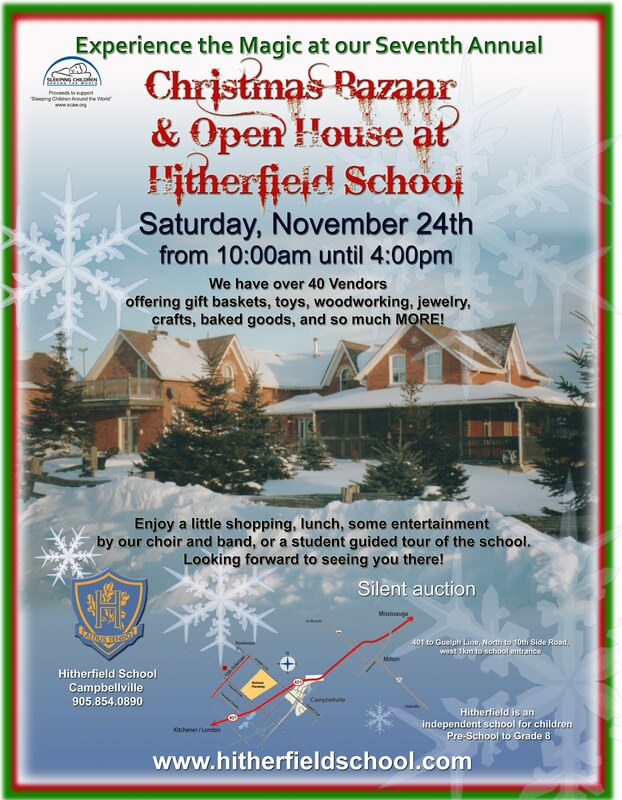 On Saturday, November 24th from 10 am to 4 pm you can help Sleeping Children Around the World and experience the magic of the seventh annual Christmas Bazaar and Open House at Hitherfield School. Tables will be set up for over 40 vendors offering gift baskets, toys, woodworking, jewelry, crafts, baked goods and so much more. 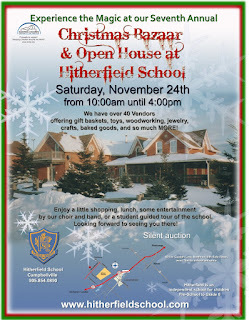 Enjoy a little shopping, lunch, some entertainment by our choir and band, or a student guided tour of the school. If you're looking to donate to the Hitherfield School campaign, click here. Directions: 401 to Guelph Line, North to 10th Side Road, west 1 km to school entrance. Click on graphic to see a larger version.